Driving into Tibet is already an increasingly popular choice for tourists – the pristine scenery is some of the best anywhere in the world. But the views are now spoiled by dense networks of power lines and pylons. And as the power grid develops these eyesores will spread to every corner of the Qinghai-Tibet Plateau. On November 23 Tibet’s first large hydropower plant at Zangmu went into operation, sparking huge concern in the Indian media. The new plant marks the start of large-scale hydropower generation in Tibet. 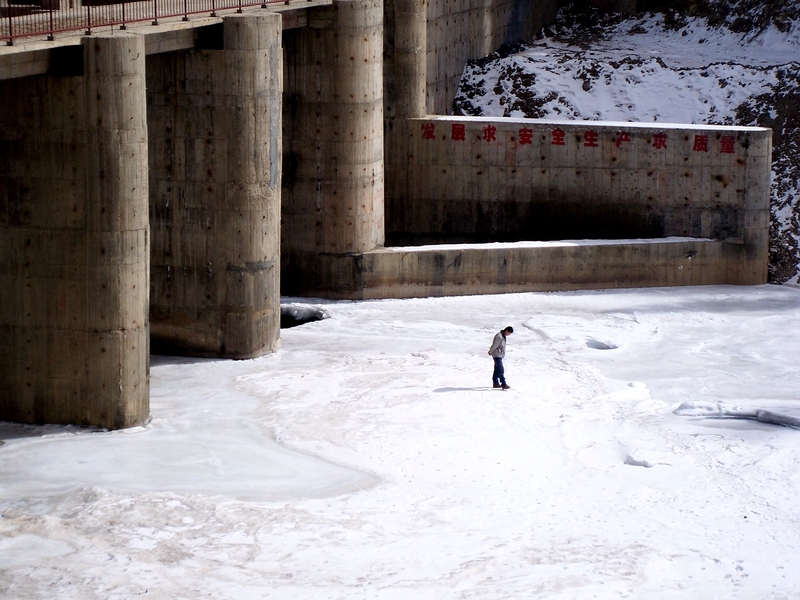 The dam at Zangmu stands 116 metres high at 3,310 meters above sea level. It has a reservoir capacity of 86.6 million cubic metres of water and a generating capacity of 510 megawatts. The project itself will not have a large impact on the local ecology or hydrology, but a single dam is unlikely to be profitable – a cascade of dams will be needed, passing water downstream in coordination with each other. Such large scale development will inevitably threaten the rivers of Tibet and the entire Plateau. If this approach is not changed the rivers of the Qinghai-Tibet Plateau face disaster. During the 13th Five-year plan large hydropower dams will be developed on the Jinsha (upper Yantgtze), Lancang (Mekong), Nu (Salween) and Yarlung Tsangpo, creating the highest density dam cluster in the world. It is not known exactly how many hydroelectric plants Tibet already has, but there are less than 10 larger ones (50 megawatts or more) and over a hundred smaller ones. These are often inefficient and short-lived. 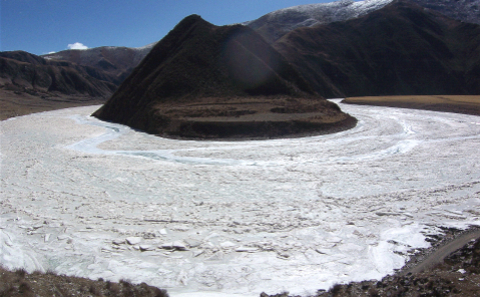 Most of the hydroelectric plants I have studied at an altitude of 3,500 metres or more in Sichuan, Qinghai and Tibet suffer from ice blockages during the five months or so of freezing temperatures every year, meaning little or no electricity is generated. The cold weather also damages equipment and greatly increases maintenance costs. 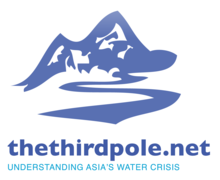 Tibet is not suited to large-scale hydropower development for two reasons. First, the Qinghai-Tibet Plateau is the source of Asia’s major rivers, and these are mostly fed by glacier meltwater, rather than precipitation. This means flows are highly seasonal and changeable and so power supply is unstable and the frozen winters and iced-up rivers can damage generating equipment. Second, due to the quality of land in Tibet’s river valleys and the geological conditions, creating reservoirs to regulate water flow is problematic. This reduces the ability of dams to regulate power generation and respond to higher demand. These two factors make development of hydropower in Tibet more technically and economically challenging. The Qinghai-Tibet Plateau is the roof of the world, a highland of global significance for its river sources and ecosystems. It should be developed for its environment, rather than for its hydropower, and the region itself does not need large amounts of power. Wind and solar power and other complementary sources of electricity should be used to supply the region’s own needs, but exporting electricity will not be worthwhile and the power grid required would cause huge damage to the area’s natural beauty. Tibet is a world-class tourist destination for both international and domestic tourists, who are attracted by its natural scenery and ancient culture. Already some popular routes and sights are marred by power lines, making them less valuable for tourism. Tibet has a range of different environments, and power supply plans can be designed accordingly. For example the south-west of Tibet has a network of rivers and so small-scale domestic hydropower generation can be used. In other areas there are good prospects for wind and solar power, and a smart power grid for the plateau should be investigated. But hydropower should not be relied upon to supply Tibet with power, much less for exports. The costs and dangers are too great. The Qinghai-Tibet Plateau is one of the world’s most geologically active regions. The earth’s crust here is still rising, causing frequent earthquakes and powerful fractures. The geology of the rivers is complex, the climate variable, the flora and fauna diverse and the ecology vulnerable. The most obvious sign of climate change is the melting or even disappearance of glaciers – something that is happening now on the plateau. For over three decades I have been made multiple visits to the plateau every year, especially the Sanjiangyuan region, where the Yangtze, Yellow and Mekong rivers rise. In October this year I found that surface temperatures at the huge glacier sources on the south-west slope of Geladan and Purog Kangri in the heart of northern Tibet were 30 degrees Celsius, with ground temperatures around 40-46 degrees Celsius. The sustained heat was leaving the glaciers scarred with gullies carved by meltwater runoff, some cut right down to the rock below the glacier, with the sounds of rocks colliding in the water echoing around. The effects of climate change on hydropower development are unknown. Large hydroelectric plants may also exacerbate climate change – most will be built in arid valleys and so the resulting reservoirs will cause local climate change, increasing the overall complexity of the problem. A strange article - who is yang yong? This is a strange article because the facts seem rather confused. It says that rivers "are mostly fed by glacier meltwater, rather than precipitation. This means flows are highly seasonal and changeable". Many parts of the world depend on the slow and steady melting of snowpack and glaciers for a steady flow; that is why European countries are worried about a reduction of snow in the Alps - they may have to build dams to replace the snow storage that could be lost. Why is Tibet different? It also says that "a cascade of dams will be needed, passing water downstream in coordination with each other. Such large scale development will inevitably threaten the rivers of Tibet and the entire Plateau". That also does not make sense. A cascade will regulate the flow of one river, reducing the need for storage and thus the impact of the dams. It will not affect the entire plateau. This is why I ask - who is Yang Yong and what is her/his qualification to talk about these matters, apart from wishing to preserve the pristine environment? Yang Yong is director of the Hengduan Mountain Research Institute, and was one of the first scientists to investigate the geology and hydrology of the upper reaches of the Yangtze and Yarlung Zangbo rivers.